San Diego residents pay an unwritten Sunshine Tax, which means a hike in the cost of living -- but also close proximity to bodacious waves, legendary craft beer, and some of the craziest of the haziest weed in the country. So if planning a day toking up next to the tidepools at Ocean Beach Pier isn’t priceless, what is? Heading into California’s second year with legalized cannabis, weed dispensaries have responded by upping their customer service regimens, adding bells and whistles, and decking out the decor. 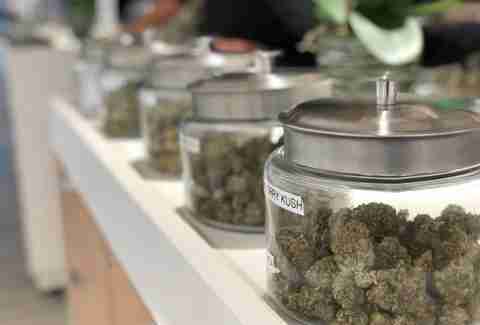 For those looking to partake in the psychoactive fun, here are the best marijuana dispensaries in San Diego. Goldn Bloom gets consumers registered through the front window in a jiff thanks to their uber-helpful staff -- a godsend when it comes to rushes on Friday afternoons or around high holidays like Black Friday or 4/20. The dispensary consistently has deals on vape cartridges from trusted names like Jetty and Strata. Look for impressive discounts on munchie Mondays, and a $1 pre-roll deal with any purchase below $50 for first-timers. 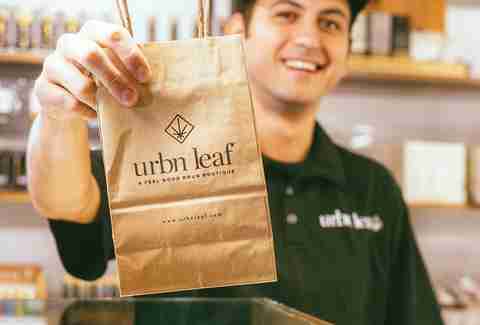 Easily the bougiest and flashiest of San Diego’s dispensaries, Urbn Leaf’s two locations in Bay Park and Golden Hill are sleek, modern, and look like they could double as matcha-serving cafes straight off of Instagram. They also sell one of the widest varieties of non-bud product out there, including lubes, suppositories, salves, and more; the bud they do have is often proprietary and high quality. Urbn Leaf has also employed a branded “CannaBus,” which it uses to shuttle would-be customers from bars in Pacific Beach and Ocean Beach right to its Bay Park location. With its accessible, central location, Harbor Collective is a haven of convenience and premium products. The shop carries many of the name brands you know and love: the inventory designer strains from Cookies by Berner and Cheech's Private Stash, edibles from Korova, and concentrates from Moxie and Raw Gardens. Harbor Collective also boasts the largest selection of extracts in San Diego county, so if you’re seeking pressed water hash, CO2 oil cartridges, or a dab of shatter pulled straight from the slab, you’ve found the droids you’re looking for. Enthusiasts’ favorite dispensary in the Point Loma area is Golden State Greens, which used to be called Point Loma Patient-Consumer Co-op. The interior is plain, but nice -- all of the floors and counters are paneled in light-colored wood, with some of the selection available in ensconced glass display cases. Like many of San Diego’s dispensaries, customer service is at a premium here, with knowledgeable, eager to please budtenders, many of whom have spent years in the industry. Here you’ll get a wide selection of top shelf flower, wax, oil and other products, and can order in advance to pick up. Claiming it’s the first dispensary in the state of California to be licensed to sell recreational cannabis, Torrey Holistics is tucked away in a Sorrento Valley office park, making it a bit of a drive for its many fans, who nonetheless flock in from all over the city. They also boast quick and inexpensive delivery for $5, which offers access to most of the dispensary’s product offerings. 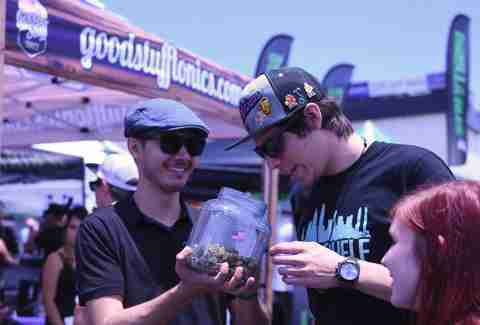 Locals also love Torrey Holistics for their product offerings -- while they do feature a good variety of bud strains, they offer fewer than other dispensaries do, choosing to focus on quality, rather than quantity. Lab tested and well-regulated, A Green Alternative sits mere feet from the Mexican border, so with “mota” soon to be legalized south of the border, you can imagine the hazy treks for fish tacos in Ensenada that lie ahead. Fast, convenient, and packed with premium top-shelf flower, this shop is a staple for South Bay stoners. Having partnered with PharmLabs, A Green Alternative tests for both safety screening and potency analysis, with info not only on their product labels but in a book containing the complete spectrometry reports. After shuttering its original location, the new Apothekare recently opened in Mission Valley. As an initial bonus, just visiting their website results in an immediate 20% off coupon and they also offer discounts for veterans and Social Security recipients. San Diegans like this shop for its wide selection -- which runs the gamut from flower to bath bombs -- and comparatively lower pricing, compared to other dispensaries in town. Customers also like the creative displays here; it’s set up more like a trendy boutique than a standard, counter-oriented dispensary. THCSD’s name leaves little to the imagination -- this is one of the city’s bonafide destinations for marijuana, despite the initialism standing for “The Healing Center.” Opting to keep its clientele strictly medical, only patients with a medical card or recommendation in California can shop here, according to Prop 215. THCSD’s claim to fame is that its medicine is twice-tested: in the lab, and by its in-house team, which ensures it meets specific standards in order to be sold to patients. The love for science here extends to the decor, which mimics an upscale lab with white countertops, walls, and floors, and all of the bud in coordinating glass jars displayed on glass shelves.